Gak (Toys) - a man dressed in green, holding a pink gooie thing. Brooke Shields (Actress) - a girl with long brown hair wearing a white shirt and a blue jacket. Steve Urkel (Character) - a black boy with glasses, wearing jeans and a green coat. Guess The 90's [Level 7] Cheats, Solution, Walkthrough for Android, iPhone, iPad, iPod. Guess The 90's [Level 6] Cheats, Solution, Walkthrough for Android, iPhone, iPad, iPod. Guess The 90's [Level 5] Cheats, Solution, Walkthrough for Android, iPhone, iPad, iPod. Guess The 90's [Level 4] Cheats, Solution, Walkthrough for Android, iPhone, iPad, iPod. Guess The 90's [Level 3] Cheats, Solution, Walkthrough for Android, iPhone, iPad, iPod. 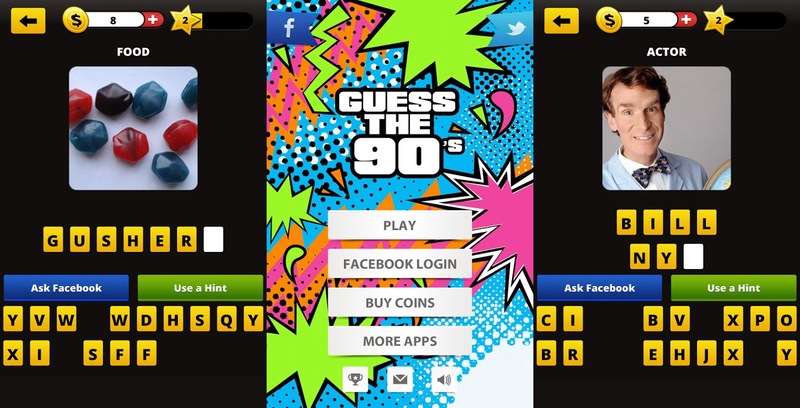 Guess The 90's [Level 2] Cheats, Solution, Walkthrough for Android, iPhone, iPad, iPod. Slap Bracelets (Product) - an hand with lots of paper bracelets. Guess The 90's [Level 1] Cheats, Solution, Walkthrough for Android, iPhone, iPad, iPod. Guess The 90's is a trivia puzzle game made by Random Logic Games. In this game you need to guess famous people, products, movies and other similar things from the 90's. There are many levels, most of them being quite easy, but there are a few that will put you in difficulty. If you are stuck at one of the level, you can find the correct solution here.